Lavish Renaissance style, combined with premium quality construction, sets the Grande Victorian entry set apart from the crowd. Inspired by Yale & Town's "Largo" pattern of 1910, this elegant design is updated with 5 fresh finishes and 6 interior knob / lever options! Silky smooth operation, exceptional solid brass forgings and a 10 year warranty make Grandeur entry hardware the perfect choice for every fine home. Lavish beauty on your doors with our premium quality Grande Victorian door set. Inspired by Yale & Town's "Largo" pattern of 1910, the exquisite Renaissance design is updated with modern Bellagio levers and high-tech mechanics. 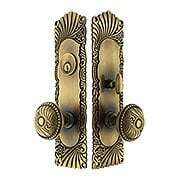 Silky smooth operation, superior brass forgings and a 10 year warranty make Grandeur entry hardware the perfect choice for your fine home. Lavish beauty on your doors with our premium quality Grande Victorian door set. Inspired by Yale & Town's "Largo" pattern of 1910, the exquisite Renaissance design is updated with modern Portofino levers and high-tech mechanics. Silky smooth operation, superior brass forgings and a 10 year warranty make Grandeur entry hardware the perfect choice for your fine home. 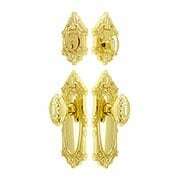 Lavish beauty on your doors with our premium quality Grande Victorian door set. Inspired by Yale & Town's "Largo" pattern of 1910, the exquisite Renaissance design is updated with modern, high-tech mechanics. Silky smooth operation, superior brass forgings and a 10 year warranty make Grandeur entry hardware the perfect choice for your fine home. 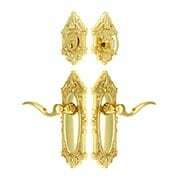 Decidedly decorative Victorian knobs add a dramatic touch to this understated rope-design door set. A unique medley of vintage styles, the "Newport" goes with everything from Queen Anne to neo-traditional new construction. 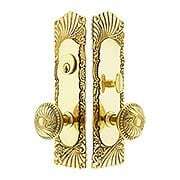 Silky smooth operation, superior brass forgings and a 10 year warranty make Grandeur entry hardware the perfect choice for your fine home. Decidedly decorative oval knobs give a hint of Victorian style to our otherwise understated Georgetown entry set. This charming melange of vintage elements is updated with high-tech mechanics, ensuring silky smooth operation every time. 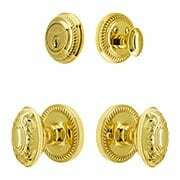 Superior brass forgings and a 10 year warranty make Grandeur entry hardware the perfect choice for your fine home. 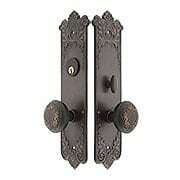 The enduring beauty of P & F Corbin's Lorraine-Pattern Mortise Entry Set (2 1/2-Inch Backset) makes this a wonderful choice for your new or vintage home. The circa 1900 design is faithfully recreated on the stamped-bronze back plates and matching bronze knobs, then finished to perfection with subtle, coppery highlights – just like the antique originals. The enduring beauty of P & F Corbin's Lorraine-Pattern Mortise Entry Set (2 3/4-Inch Backset) makes this a wonderful choice for your new or vintage home. The circa 1900 design is faithfully recreated on the stamped-bronze back plates and matching bronze knobs, then finished to perfection with subtle, coppery highlights – just like the antique originals. Purists will delight in this faithful reproduction of P & F Corbin’s lively and charming “Roanoke” pattern mortise entry set. The circa 1900 design works well with everything from Queen Anne to Craftsman, from restorations to new construction. 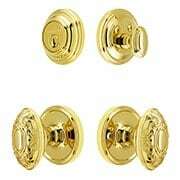 Cast in solid, non-corrosive brass that’s ideal for all weather conditions, these back plates and knobs are left unlacquered, allowing them to age gracefully, just like the antique originals. Purists will delight in this faithful reproduction of P & F Corbin’s lively and charming “Roanoke” pattern mortise entry set. The circa 1900 design works well with everything from Queen Anne to Craftsman, from restorations to new construction. Cast in solid, non-corrosive brass that’s ideal for all weather conditions, this set comes in our own Antique-By-Hand finish. This hand-applied process produces a living finish that continues to age gracefully for many years to come.